Noticias Telemundo is partnering with PolitiFact, Poynter Institute's fact-checking news organization, to analyze news for its Spanish-language audience as it prepares for the upcoming presidential election in 2020. “Hispanic issues are at the center of the political conversation, which is becoming increasingly polarized,” stated Luis Fernández, executive vice president, Noticias Telemundo. PolitiFact reporters and editors will appear for on-air interviews on Noticias Telemundo, which delivers Spanish-language content to U.S. Latinos and audiences worldwide. Noticias Telemundo will send statements to PolitiFact to fact check. 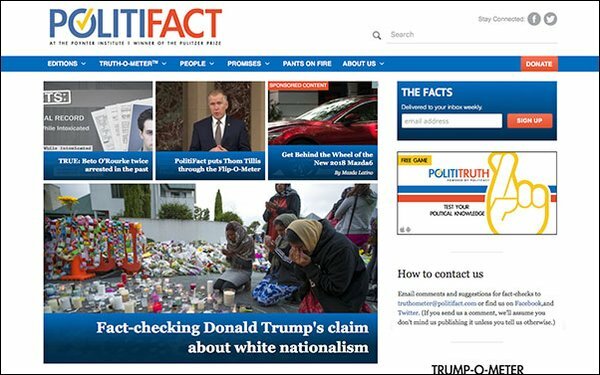 The two organizations will also collaborate to translate PolitiFact fact checks into Spanish, which will appear online and on TV for Noticias Telemundo and the broader NBCUniversal Telemundo Enterprises. Telemundo Network delivers original Spanish-language entertainment, news and sports content to 94% of U.S. Hispanic TV households in 210 markets, through 28 local stations, 51 affiliates and its national feed, according to the company. The Poynter Institute, a nonprofit organization, acquired PolitiFact in 2018. It is the largest political fact-checking news organization in the U.S.
“Our collaboration means that a huge contingent of the U.S. population can now determine the accuracy of information in their native language,” stated Neil Brown, president, PolitiFact. It will be Telemundo’s first time hosting a U.S. presidential debate. In 2016, NBC News and PolitiFact joined forces; its fact-checking content was available on NBC, NBC News and MSNBC sites.